Wearables signify the latest potential shift in consumer technology from mobile phones and tablets to smart, compact, lightweight devices that typically offer ubiquitous connectivity. Wearables can be easily worn by the user somewhere on their body and are accompanied by sensors, user interaction features and a computing architecture. Analysts recommend that the next wave of manufacturing should focus on a complete transformation of plant operations, where end-to-end supply chain is connected. Workers on the field or standing at a machine need real-time information which is critical and cannot be delayed. Wearables allow more freedom to users with their hands-free and light nature. Findings indicate that using wearable tech in manufacturing can improve customer satisfaction by 3.5% and workplace productivity by around 8%. 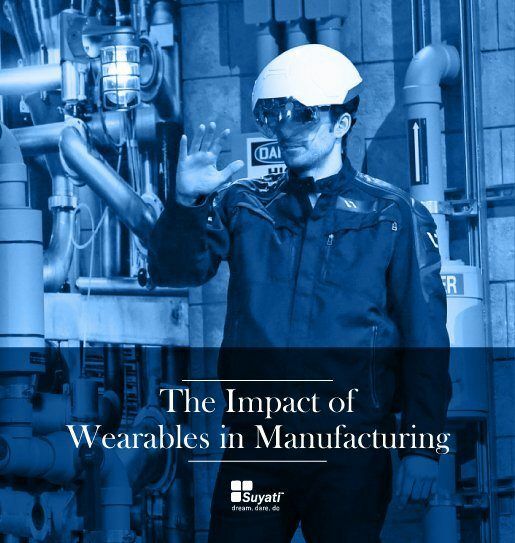 This e-book takes a look at why wearables are on the brink of mainstream adoption in the manufacturing domain and how they impact manufacturing. Download your free copy of the e-book now!